Many investor or home buyers want to know how they can increase their borrowing capacity so then they can afford to purchase the property they want or so they can go out and purchase more investment properties. Today I sit down with Brad from OceanHomelands.com.au and he shares his insights as a mortgage broker into how investors or home buyers can go about increasing their borrowing capacity so that they can borrow more or that they can get better loan. This is an awesome interview and some of the tips that he gave I had never heard of before. It’s definitely one worth listening to all the way to the end. So here we go, here’s the video with Brad. Ryan: Hey, this is Ryan from PositiveCashflowAustralia and today I’ve got with me again Brad from OceanHomelands which you can find at OceanHomelands.com.au. Today we are talking about something that I think is very exciting which is how you can increase your borrowing capacity. So, thanks for coming along today Brad and letting me interview you. We wanted to talk about ways that investors or even first home buyers can increase their borrowing capacity. We were talking about this before the video and some of these things I had just never heard of so I’m pretty excited to get your insight. Brad: That’s great. There’s this sense of a one such as not having a lot of other debt. The problem one is obviously credit cards. Credit card is not what you own on the credit card, it’s the limit you have on the credit card. Flashing around that platinum $24, 000 limit credit card or $30, 000 credit card is not the greatest thing when you’re borrowing for your first time, that’s for sure. Because that equals $90, 000 off the gross income that you have per year. Ryan: I think people, investors and buyers need to understand this. It’s not how much debt you have on the credit card, it’s how much limit you have. Because you or I can go out tomorrow and we could bet it all on black at the roulette table and it could come out red or green and we can lose it all and have that debt. So the banks are going to take into account the repayments that you’ll have to make if that credit card was full. Brad: That’s exactly correct, that’s exactly how they treat it. They treat it as month’s secured personal lot. So if that credit card was full and they’re say you’re probably going to have to pay about 30% of that per year as an estimate, so for $10 000 you’re look at an extra $3, 000 in serviceability that you’re losing every year. So that’s one thing to look at. What else can we look at to increase our borrowing capacity? Brad: Obviously, having clean credit is another one. It’s a simple one. If you’ve got multiple defaults on your credit file you’re more than likely not going to be acceptable to **mind storm** lender. You will have to gather an **open formula** of specialist lender. As you are considered a greater risk they will charge a higher interest rate which is right for risk. So clean credits are important things. That’s a simple way to check if you have conducted your financial affairs correctly, promptly, with new changes to the privacy act and how credit is being reported you need to make sure you pay your bills every time and on time. Ryan: A lot of people don’t know there’s new changes to the privacy act that are about to come in 1st of March, and so it will be a lot stricter on the defaults that you have with your bills. Brad: It’s more information available to the lenders. A default is a default – that’s something you **have in private**. But they will be recording whether you are light or didn’t pay the full amount on time. That’ just gives **recordings of miss-payment**. Ryan: Is that on anything that we have? Like on our phone bill, internet, home loan? Brad: Yes. Anything the **way credit** has been provided when you’re in a contract. But if you’ve got a contract with ***, Vodafone whatever.. Your electricity bill, your gas bill, everything – that is available to lenders if it’s recorded. Now it doesn’t mean they’re got all record it, but I honestly don’t believe they won’t. I believe they’ll record as much as possible because more information they have, they believe they do better decision making on giving that. Ryan: Moving forward we need to be even more careful about paying our bills on time then we already had to be careful about. Because there was some level of latency before you got a default on your credit file, you might have paid a bill later or something like that, where as now they’ll be able to see if you’ve paid your bills late and that could effect your borrowing capacity in the future. What else can we do to increase our borrowing capacity? Brad: If you apply for a fixed load of three years or greater, they treat servicing of your application differently. This always ends up in allowing borrower a greater **math**. They’re **constable** to lender because they know you’ve got the **signed** repayments for 3 years or more. Ryan: A lot of people, especially a lot of investors kind of shy away from fixed rate for whatever reason, but you’re saying that fixed rates in some circumstances if you need that extra borrowing capacity that could be the advantage that you need. By going with a 3 year fixed rate or more. Brad: 3 or more, yeah. Works for obviously your own home purchases as well but for investors very much so. And investors really should look at fixed rates because investing a property is not a short term, it’s long term. I think in a current climate, fixed rates have never been this low. So if you’ve got investment property, I would be seriously considering looking at fixing for 3 years or even greater, because as long **don’t** have a long term **hold**, it sure to be fantastic. Ryan: I think with a fixed rate, after speaking with you, if you’re looking at that and you want to increase your borrowing capacity then I think going to a mortgage broker is going to help you do that. Because, as we have discussed in past videos, different lenders use different criteria to work out what you can borrow. And some lenders with a fixed rate, you’re not going to automatically get more borrowing capacity because some lenders will still add a **beard of a buffalo** to your borrowing capacity just by having a fixed rate. Brad: They don’t have a standard **right for servicing loans** for whether you’re applying for a **beard** or fixed interest only, they just have a standard right. Ryan: So just because your interest rate that you’re getting is 5%, doesn’t mean the bank is assessing you on an interest rate of 5% for serviceability. The banks are looking for security, they’re looking into the future and so they going to add a buff up to say ‘we are actually going to check you out at 7%, even though you’re not paying that today. Brad: But you could well be paying them in 3 years time, who knows. That’s just common sense, landing approach, being responsible to their clients, thinking that ‘well if there are **raises** it still can be paid’. And during that period of time you could then make decisions yourself, to say ‘well it’s getting closer and closer to what I’m not comfortable with, maybe I should be looking at fixed’. Ryan: And that’s why a fixed rate can give you more borrowing capacity because the buffer that most lenders will put on a **variable right** wont necessarily be added to a fixed rate. Brad: There are several lenders that look at it that way. It’s not the most common practice. Ryan: So you really need to know which lenders do this, so again go and see your mortgage broker, someone like Brad or whoever you choose to go to. So what are some other ways, that’s one I didn’t know of and I was excited to find out about, what else is there? Brad: I think the majority has already been said. That’s most of things covered for purchasing your own home, but for investors there’s several more. Obviously, the investors are aware of the benefits of the negative gearing. Obviously I’d rather have a positively geared property because it’s making me money. Ryan: Rather make money and pay tax then lose money and save tax. Brad: Yeah, but if your portfolio or investment property is negatively geared or you are purchasing a property that will become negatively geared, not all lenders give you the benefit of the negative gearing in the serviceability of that loan application. But yes, obviously you’re making loss. It’s like a business, you make a loss, there’s obviously an offset of tax against that. Ryan: But that offset of tax some – lenders will take that offset into account where as some lenders won’t take that offset into account. So by going with a lender who will take that offset into account, you may be able to increase your borrowing capacity. Brad: But always talk to your financial advisor before going into negative gearing. Ryan: Yes, always speak to you tax accountant or financial advisor. Brad: Yeah, it’s got to be said because we’re not licensed to provide advice on negative gearing. We can utilize it’s benefits when looking at loans for people. So we keep it at that. If you need an advice, I always would recommend an accountant. Other things that banks do differently, if you happen to be a commissioner or you do a lot of overtime, or you get a lot of bonuses, you might have a second job which is part time – every lender just about treats every one of those situations differently. Some will only accept 50% of the income from the second job, some will accept 100%, some want to use evidence of your bonuses or your commission – it’s a combination, it’s a very complicated matrix. So to be able to utilize all of your income you need to be using the right lender who will take into account all your income at its maximum amounts. Ryan: So if you’re working on a commission basis at all, like I used to be a pharmaceutical rep, and a large portion of my income, 40% or more was commission based. So for me choosing a lender who is actually going to accept this commission is going to make a huge difference then going to a lender who will only accept 50% or who won’t accept any at all. So if you’re not just your standard full time employee, casual or part time or commission or bonuses, then you really need to find a lender that’s going to suit you best. Brad: Yes, your income position can very much dictate the type of the lender that will be best for you. 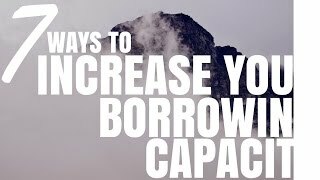 **Other ways to increase your borrowing capacity…** Other bank debt for investors, this is a slightly more complicated one. We’ve talked about servicing. If you’ve already got an investment portfolio you may have one or two loans existing out there and say they’re at the moment at 5%. And you want to get another investment property for your portfolio at interest rate of let’s say 5%, normally that new bank will service you at 7% because they added that 2% buff up, and they would do that on all your landing even though they’re not going to get the landing on your existing loans. But there are lender who will assess your application for thi loan only using the actual interest rate that your other loans have. So if one or two other loans are assessed at 5%, your new landing is assessed with a buffer but obviously by reducing the interest rate they’ve counted on your existing loans, increases the amount you can borrow. Ryan: So basically, if you have multiple mortgages, some lenders will look at the mortgages you have and will add a buff up to that and calculate that as your serviceability. Whereas some other lenders will look at the mortgage you have and an interest rate and leave it at that and won’t add a buff up. Meaning, the repayments that they expect you need to make will be lower meaning you’ve got more money available for borrowing with them. Brad: I couldn’t have put it better, that’s exactly what it means. Ryan: There’s no point us going into which lenders do this or which lender should I go to because, truthfully everyone’s situation is different and these things change all the time, daily, constantly. There’s no point in us saying you should go to this lender for this situation or that for that because really what we say today might be different tomorrow. Brad: 99% will be the same but yeah, there’s always **twigs**, there’s always little changes coming. Banks come out with new policies, mortgage insurances come out with different policies, times change. Banks get concerned when there’s trouble in economy. So yeah, use a mortgage broker who has access to all information, that’s what we’re trying to say. I have access to the information of all the lenders where as you **go and call all the lenders often**, ask every question. Ryan: Yeah, so you could pick up the phone and you could call 30 lenders and you could ask 30 lenders what the situation is, but they’re all going to try and turn you on their loan anyway. When I was talking to Don the other day, he was saying ‘look, every investors needs to have their investment **tame**, and you need accountant, you need solicitor and one of those people that you do need on your team is a mortgage broker and someone that can look at all of the loans for you and help you assess which one is best for you. I do find the mortgage broker industry and the service very helpful to many investors. So I would recommend, especially if you want to increase your borrowing capacity or if you have, I’d say anything that’s out of the ordinary. We’ve not all been in the same job for 30 years owning the same amount of money, so there’s always some little quirk in our laws. I do suggest that everyone who’s getting a loan should consider going to a mortgage broker and getting their advice. As you have seen through this video, Brad has a wealth of knowledge on the different aspects of it, and some of those things like the fixed rate and the buffers was not necessarily things that I knew. So just by seeing him today, I’ve gained a wealth of knowledge. Thanks so much for coming. If you guys want to get in contact with Brad or of you want access more information he has a blog which he updates on a regular basis and you can check that out just by going to OceanHomelands.com.au. I do believe that you do service people all around the country, am I right? Ryan: So with a mortgage broker that don’t have to live next door you can pick up the phone, give him a call and things can be done over the phone, email, video chats, any way we can communicate. Thank you so much for coming and hope to catch up again soon. f you want to get in contact with Brad and take advantage of his expertise for your next home loan, he does offer free services for almost all of his loans, then go to his website which is OceanHomelands.com.au or if you want to have full list of mortgage brokers then head over to PositiveCashflowAustralia.com.au/brokers and you can check out our list there which Brad is on that list. Thank you so much for watching this video, I’m so grateful. Thank you so much Brad for taking the time sitting down with me and sharing your knowledge and my audience. So until tomorrow which is when the next episode comes out so stay positive!